This is the incredible story of Bao Luong, Vietnam’s first female political prisoner. In 1927, when she was just 18, Bao Luong left her village home to join Ho Chi Minh’s Revolutionary Youth League and fight both for national independence and for women’s equality. A year later, she became embroiled in the Barbier Street murder, a crime in which unruly passion was mixed with revolutionary ardor. 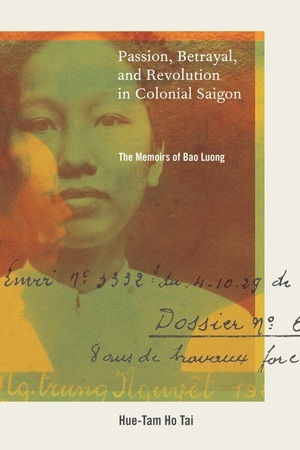 Weaving together Bao Luong’s own memoir with excerpts from newspaper articles, family gossip, and official documents, this book by Bao Luong’s niece takes us from rural life in the Mekong Delta to the bustle of colonial Saigon. It provides a rare snapshot of Vietnam in the first decades of the twentieth century and a compelling account of one woman’s struggle to make a place for herself in a world fraught with intense political intrigue. Hue-Tam Ho Tai is Kenneth T. Young Professor of Sino-Vietnamese History at Harvard University. She is the editor of The Country of Memory: Remaking the Past in Late Socialist Vietnam (UC Press) and the author of Radicalism and the Origins of the Vietnamese Revolution and Millenarianism and Peasant Politics in Vietnam.